10/21/06: Roslin likely admits to misleading Helo and Sharon about Hera's death and her likely death (along with Maya) on New Caprica. 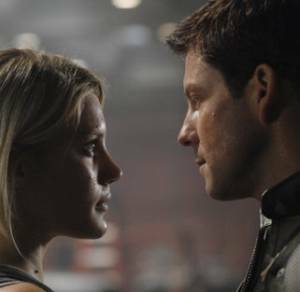 10/21/06: Tigh and Kara lead a growing division in the fleet between those who went to New Caprica and those who stayed with the fleet. This leads to a rift between Adama and Tigh that lasts two or three episodes. 10/21/06: The Cylon basestar finds the beacon and is infected. Baltar is sent to investigate. Thus, Caprica Three and the other Cylons also learn the clue about Earth. This promo pic likely shows Baltar either prepping to leave or coming back from the infected basestar. 10/15/06: Helo gives Roslin a verbal tongue-lashing over Hera. 10/13/06: The hybrid Cylon is essentially a basestar's pilot. The hybrid is confined to one room and is in human form from the waist up. The lower half connects with the basestar itself allowing instantaneous control of the ship's critical systems. Tricia Helfer interview in Battlestar Magazine. 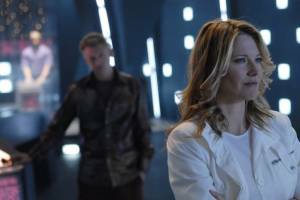 More Caprica Three on the basestar [which was a given]. 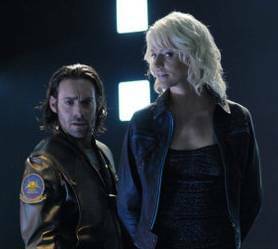 [Speculation: Caprica Three is using her connection to Hera to convince Baltar's Six and Galactica Sharon of her "destiny" to lead the Cylons (and name herself a god). 10/7/06: A hybrid Cylon is introduced. 10/3/06: Helo learns that his daughter, Hera, is alive and he doesn't take it too well. 10/3/06: The basestar had found a beacon from Earth and brought it onboard. It was contaminated with the virus. The source of the virus is disclosed in the episode. 9/27/06: Preliminary Episode Synopsis: A basestar is found to be dying of a plague.